There are different types of camera dolly. A full scale professional piece of kit as they use on hollywood films would be ideal and if you have the budget and the manpower to operate it, that would seem the best solution. But filmmaking is about compromise and most of us can't justify such equipment. A flatbed or T frame dolly is the next best thing. 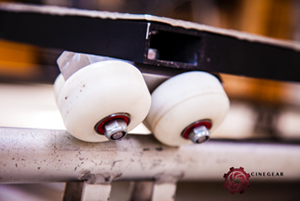 Whilst professional dollies have specialised wheels to fit rails, most DIY tutorials point towards a system with angled skateboard wheels. The advantage of the T frame over the flatbed is portability, cost and the fact that it can easily go around curved track due to only having three points of contact. the disadvantage is that you cannot sit on it, but does that matter? in many cases no, a T frame would be far better as you can get it to location and set it up quicker than a flat bed. But for precision shots where the camera operator needs to accurately pan whilst the dolly is moving and the focus puller needs to keep the action in focus it helps to divide the roles of the grip, camera operator and focus puller. What is the difference in cost between a T frame and a flatbed. Not much actually! 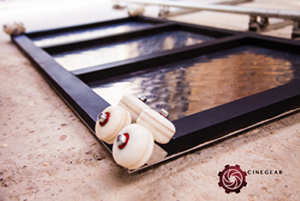 Although a T frame is much smaller and lighter it still requires 3 of the 4 sets of wheels which are the greatest expense of the construction. Therefore I believe it can be said that the main reason to have a T frame over a flatbed is portability not cost. For documentary or solo filmmakers, a T frame is definitely better, but with a team of three or more and slightly more time to set up, a flatbed dolly just gives so much more scope for creativity. So whether you have decided on a T frame or flatbed, the next question is, should we be making it ourselves? It would seem logical that you could save money, but in reality it is very difficult to create something of decent quality for less. Cinegear, an independent film equipment developer based in the UK have designed a fantastic flatbed system with an affordable price tag. We recommend checking them out before going to the hardware store. They are launching on Kickstarter on June the 1st with the promise of some great early bird discounts.